Vertical section of human cornea from near the margin. Magnified. The Bowman's membrane (Bowman's layer, anterior limiting lamina, anterior elastic lamina) is a smooth, acellular, nonregenerating layer, located between the superficial epithelium and the stroma in the cornea of the eye. It is composed of strong, randomly oriented collagen fibrils in which the smooth anterior surface faces the epithelial basement membrane and the posterior surface merges with the collagen lamellae of the corneal stroma proper. 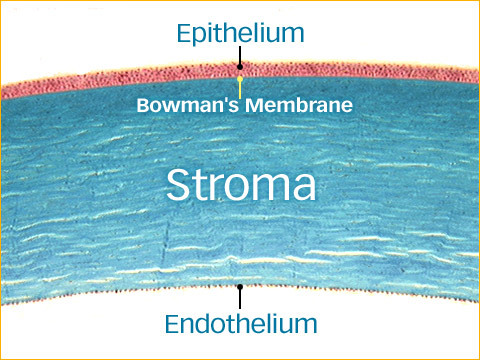 In adult humans, Bowman's membrane is 8-12 μm thick. With ageing, this layer becomes thinner. The Bowman's layer, in mammals, is found only in primates. The function of the Bowman's membrane remains unclear and appears to have no critical function in corneal physiology. Recently, it is postulated that the layer may act as a physical barrier to protect the subepithelial nerve plexus and thereby hastens epithelial innervation and sensory recovery. Moreover, it may also serve as a barrier that prevents direct traumatic contact with the corneal stroma and hence it is highly involved in stromal wound healing and the associated restoration of anterior corneal transparency at the morphological level. 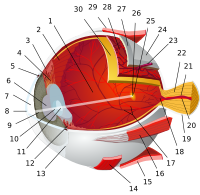 Part of the Bowman's membrane is ablated by the photorefractive keratectomy refractive surgery (commonly known as PRK). As the layer is non-generative, the section of the membrane ablated in the procedure is lost forever. The Bowman's membrane is named after Sir William Bowman (1816–1892), an English physician, anatomist and ophthalmologist, who discovered this membrane. Bowman's layer is not a membrane and should not be called a membrane. The term Bowman's layer is now starting to gain acceptance. ^ Kenyon, KR. Morphology and pathologic responses of the cornea to disease. In: Smolin G, Thoft RA, eds. The Cornea. Scientific Foundations and Clinical Practice. Boston: Little, Brown & Co.; 1983:45. ^ Merindano MD; Costa J; Canals M; Potau JM, and Ruano D. "A comparative study of Bowman's layer in some mammals: Relationships with other constituent corneal structures." European Journal of Anatomy. Volume 6, Number 3, December 2002. ^ Wilson, SE; Hong, JW (Jul 2000). "Bowman's layer structure and function: critical or dispensable to corneal function? A hypothesis". Cornea. 19 (4): 417–20. doi:10.1097/00003226-200007000-00001. PMID 10928749. ^ Lagali, N; Germundsson, J; Fagerholm, P (Sep 2009). "The role of Bowman's layer in corneal regeneration after phototherapeutic keratectomy: a prospective study using in vivo confocal microscopy". Invest Ophthalmol Vis Sci. 50 (9): 4192–8. doi:10.1167/iovs.09-3781. PMID 19407024. This page was last edited on 27 November 2018, at 00:00 (UTC).